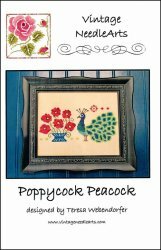 Poppycock Peacock [C5374] - $10.00 : Yarn Tree, Your wholesale source for cross stitch supplies. A cross stitch pattern from Vintage NeedleArts. Fancy seeing your here! With his large, colorful, ornate tail, this peacock was born to stand out! While strutting his stuff, he is headed for the flower pot of blooming poppies. Admire his beauty as you stitch this design! Stitch count is 125W x 86H.